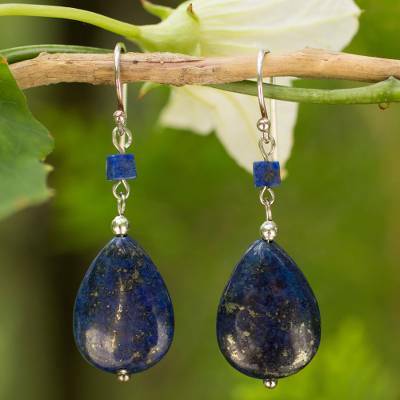 Lapis Lazuli Dangle Earrings, "Blue Lily"
Thought to purify the soul, lapis lazuli is a mesmerizing gem. It also represents September´s birthstone. Its deep, rich blue finds the perfect complement in sterling silver earrings by Somluck Komolmith. You can find lapis lazuli dangle earrings 'Blue Lily' by Somluck Komolmith in jewelry categories such as Birthstone Earrings, Lapis Lazuli Earrings, Silver Earrings, Sterling Silver Earrings and Dangle Earrings. Enjoy exploring these sections for other Novica treasures. They make me feel like a lady when I wear them, they're comfortable, and I just really enjoy them! Whenever they match an outfit or my mood! The earrings were delicate and well made. This was my first purchase and I chose these because my birthday is September and I am very happy with them. Delivery was prompt thru DHL.Thank you Ms. Somluck for my beautiful new earrings.